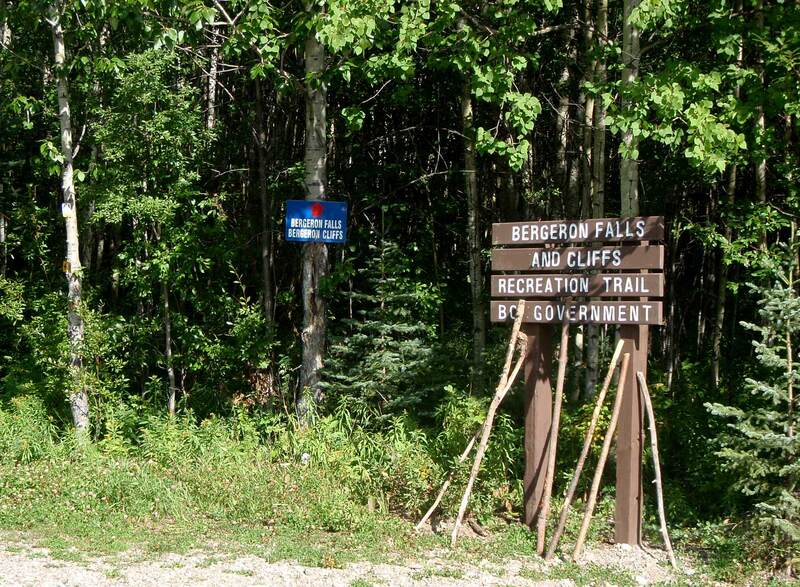 The trails to Bergeron Cliffs and Bergeron Falls are maintained by volunteers of the Wolverine Nordic & Mountain Society. 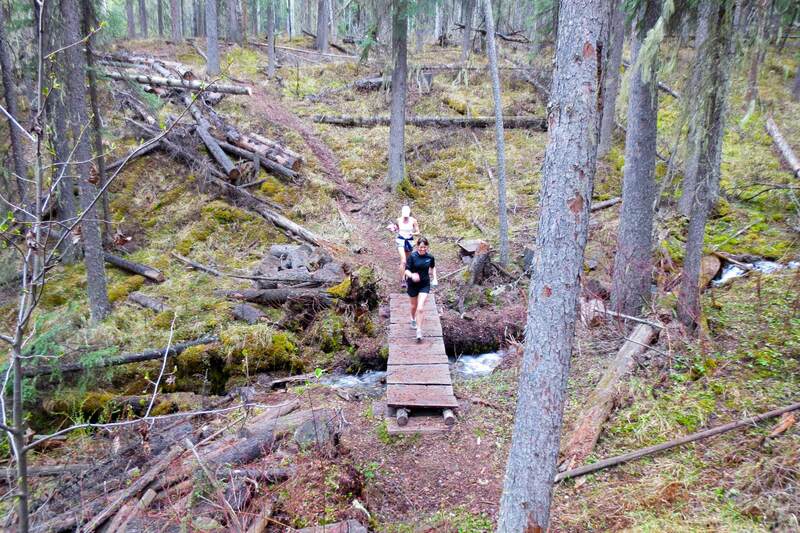 The first 500 metres of trail are shared, after which there is a fork: cliffs to the left, falls to the right. Further on a connector trail links the two trails for those who wish to visit both destinations. 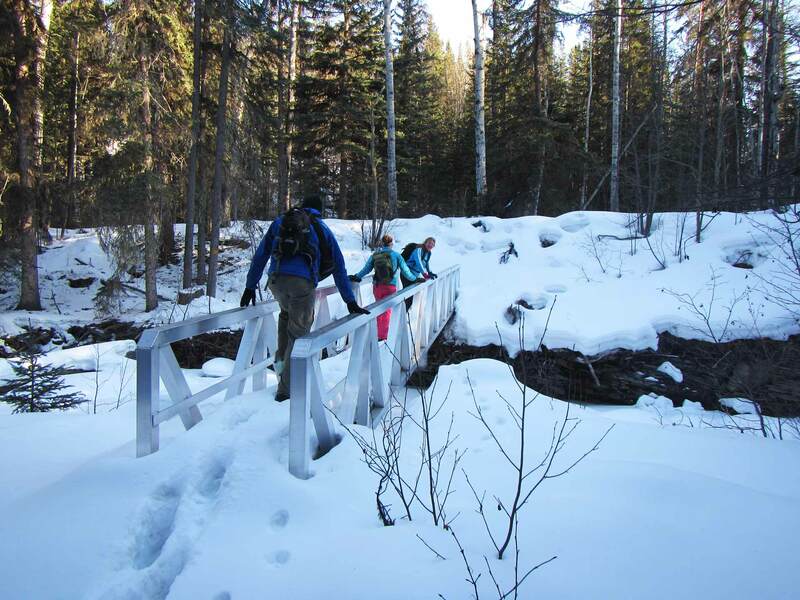 Both trails have interpretive signage highlighting geological and scenic features. 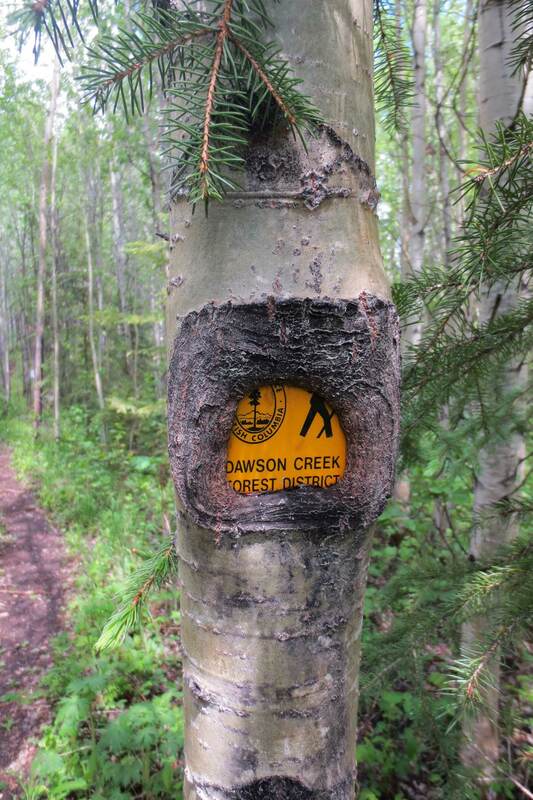 Pioneer ranchers needed to visit Dawson Creek once or twice a year, and pack trails were developed. Sometimes these coincided with traplines. Such routes were built on both sides of the Murray River, which in places provided a relatively easy conduit for travel. A well preserved historic pack trail leads from here down to the Murray River. 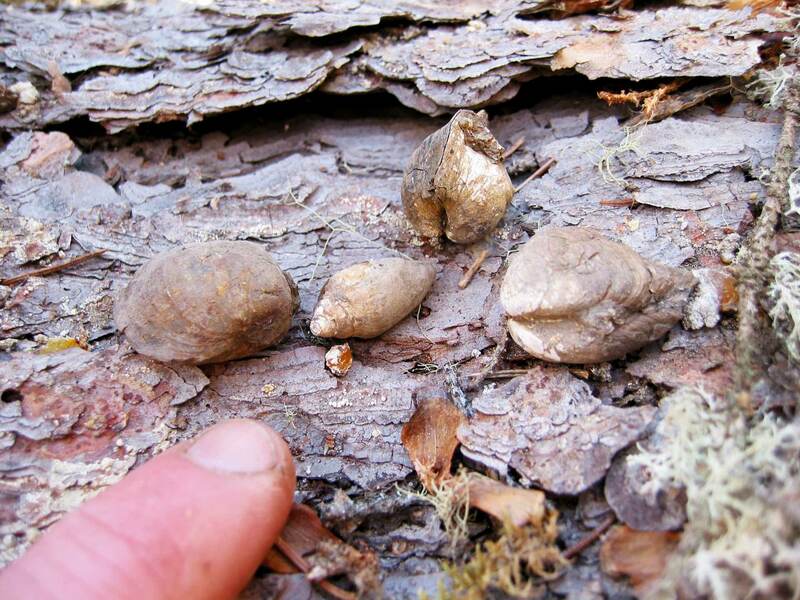 Vestiges of trapping activity can be discerned in places. Two very different creeks enter the river here within metres of each other. The spring-fed creek which the main trail is about to cross rushes noisily down to river level. Just upstream Vomer Creek finally sleepily enters the river, after meandering for two kilometres along the base of bluffs through a series of swamps and beaver dams. Pioneer users of the trapline: Vic & Kathleen Peck, Frank Gesler, Aunt Kate Edwards, John Terry. Vomer Creek drops into a small canyon lined by thin-bedded sandstone cliffs. When the creek flows over this ledge of resistant bedrock, erosion happens slowly, while the water can more easily erode the softer rock beneath it. The vomer is the thin midline bone of the nose, which is easily fractured. An injury to this bone sustained here by a volunteer trail-builder gave the creek and falls their names. 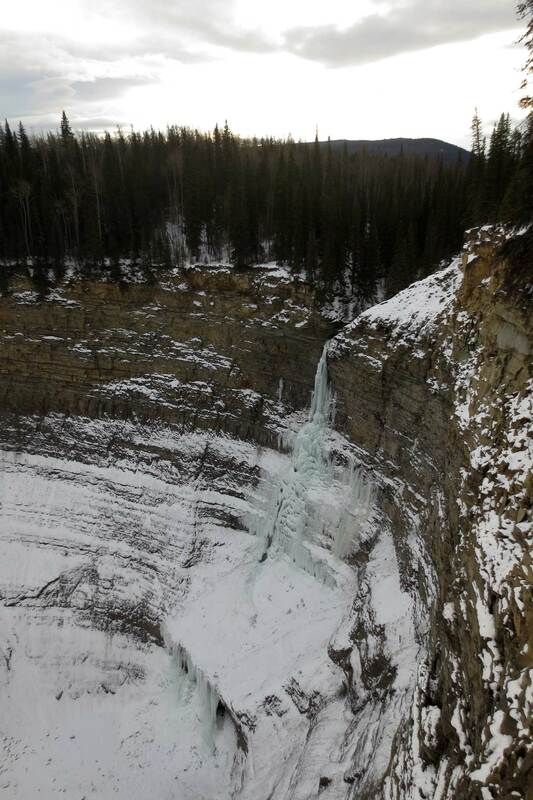 For over a kilometre past Vomer Falls the trail follows a straight seismic line. 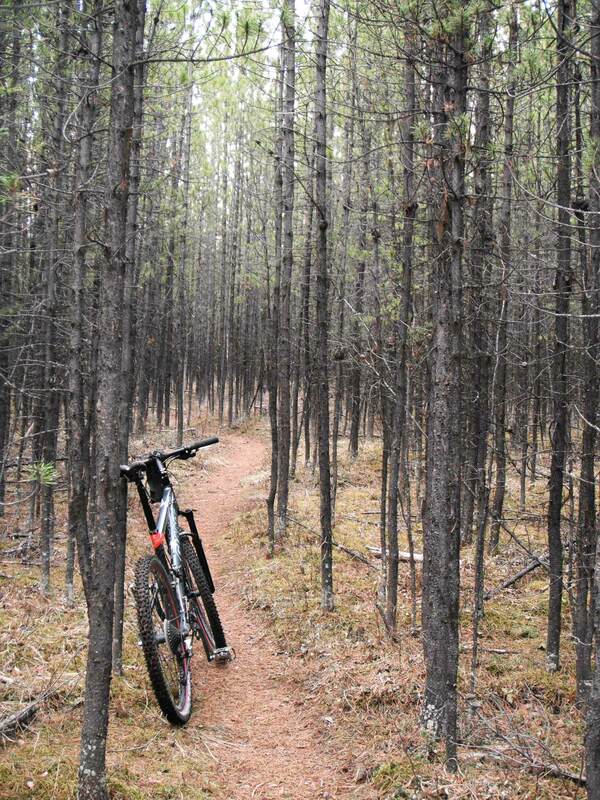 This made trail construction a lot easier, as an existing feature could be used. However, such features scar the landscape and provide sight lines for predators to see their prey. Such seismic lines were the norm in the 1980s and earlier. Since the 1990s seismic lines have been designed in a very different manner: narrower, with frequent twists and turns. As a result, they are hardly noticeable after a couple of years. 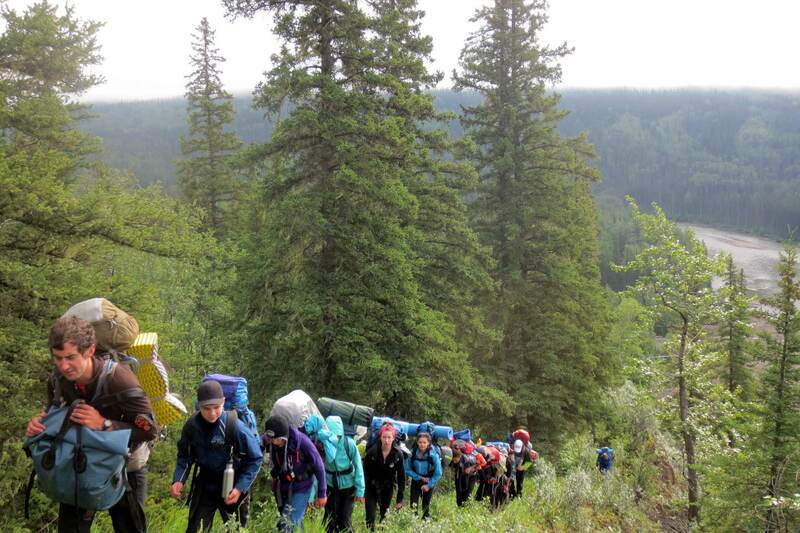 The trail stays well away from the cliff edge, and hikers are urged to stay on the trail. This is because there is an active area of erosion below, where the Murray River sweeps around a curve and cuts into the bluffs above. The trail has had to be rerouted away from the cliff edge a number of times, and the original trail has disappeared into the void. 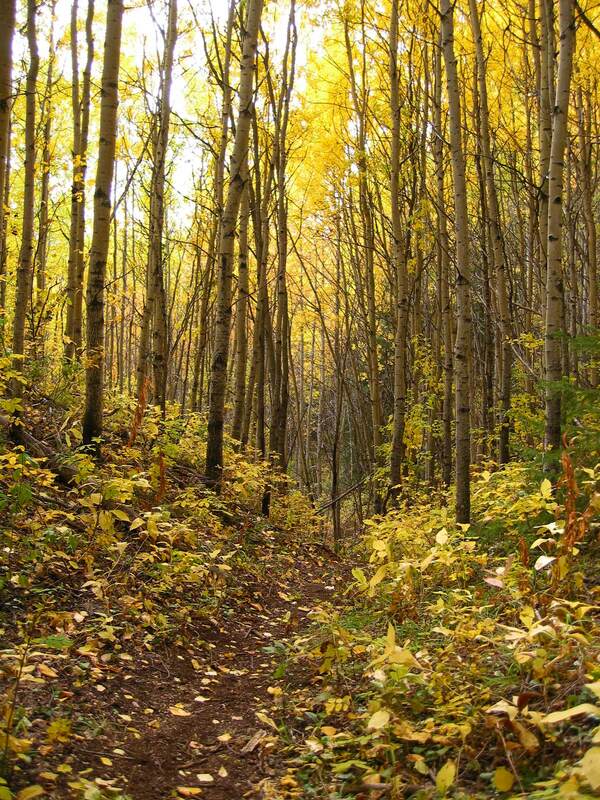 The trail follows a sharp ridge, with the river far below on one side and the forest floor below on the other. The sands and gravels forming the ridge and bluffs were deposited by a large glacial lake and the streams that fed into it. The lake was formed in the late stages of the last Ice Age when masses of ice blocked the drainage of the Murray and Peace rivers. 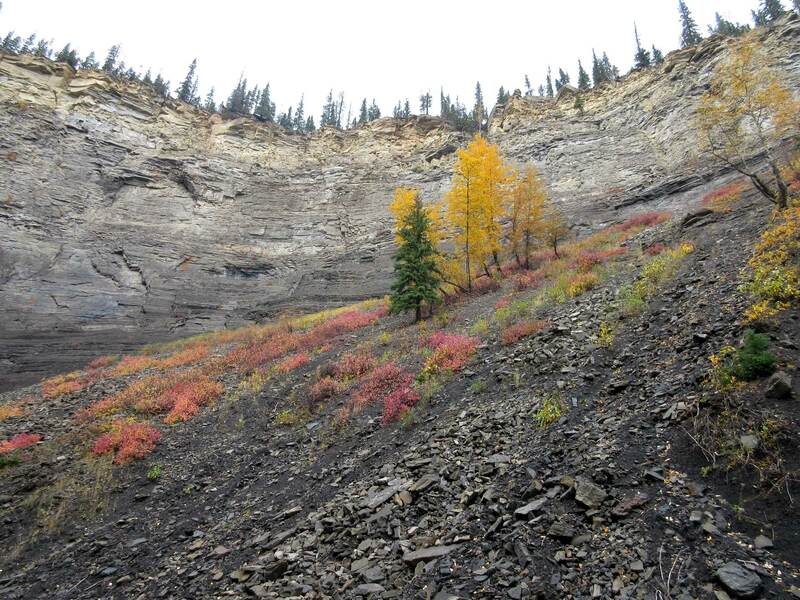 This dry, steep, sun-exposed surface supports few trees; instead Rocky Mountain Juniper and Kinnikinnick (bearberry) form the predominant vegetation. A tongue of gravel can be seen extending into the Murray River at the mouth of Bergeron Creek, debris from upstream that has been washed down after floods. After the flood of 2011 this stretched more than 70% across the river, which was forced to squeeze through the resulting narrow channel. Slowly the river has been diminishing the size of this tongue of land since then. Future events will undoubtedly perpetuate this ongoing tussle between river and creek. Constructing a permanent bridge across the creek from this gravel bar is futile: each flood event causes the course of the creek to change. The remains of a well-intentioned attempt at one such bridge can be seen. Instead, temporary log crossings are built each year, and when the creek is in flood this section of the trail becomes impassable. Bergeron Creek is one of many tributaries of the Murray River that enter the valley by means of spectacular waterfalls. 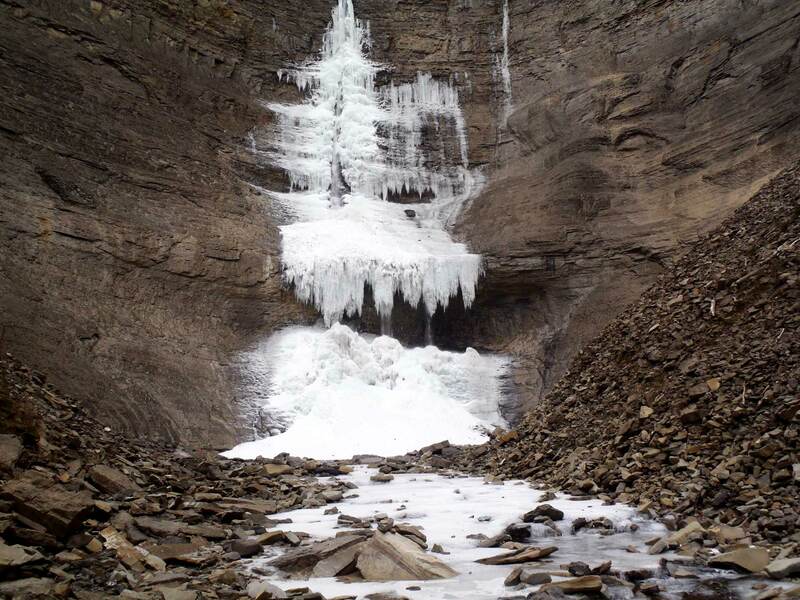 The river valley was deepened when the great Pleistocene ice sheets moved down the valley, and the tributary creeks form waterfalls and deep canyons where they encounter resistant bedrock. Looking upstream on the Murray River, bluffs made up of glacially derived sediments can be seen. The bottom half of the slope is sandy and silty, and represents sediment deposited in glacial Lake Peace. The upper layer is composed of gravel, sand, and boulders, and was deposited by streams flowing into the lake. The flow rate of the Murray River varies significantly, with a mean of 56 cubic metres per second, dwindling to ten in February, rising to 193 in spring run-off, and with a record of 872 cubic metres per second in 1990. The river rises in the Hart Ranges of the Rocky Mountains at the Bulley Glacier, over 2600 metres above sea level. 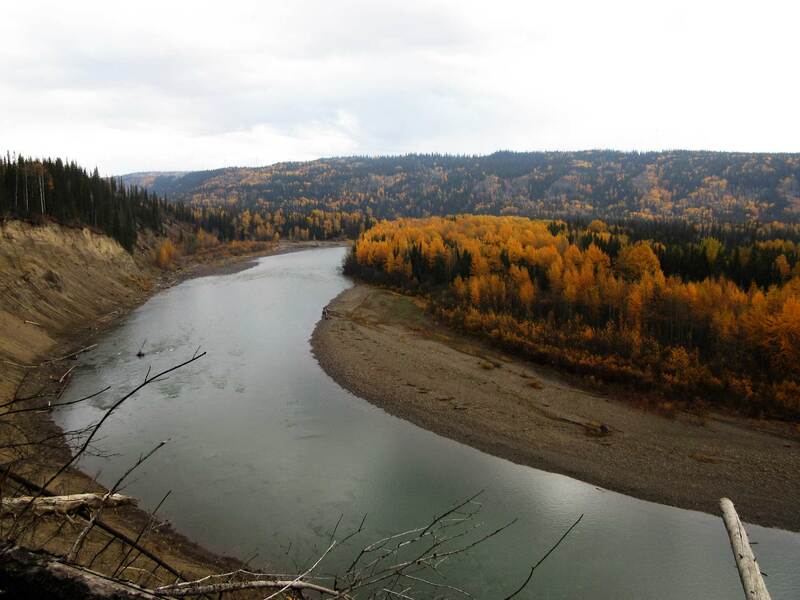 In their journey to the Arctic Ocean near Inuvik via Mackenzie River, these waters encounter no human-made obstacles, but instead just encounter a few river-wide ledges downstream, the Vermilion Chutes on the Peace River, and the Slave Rapids near Great Slave Lake. 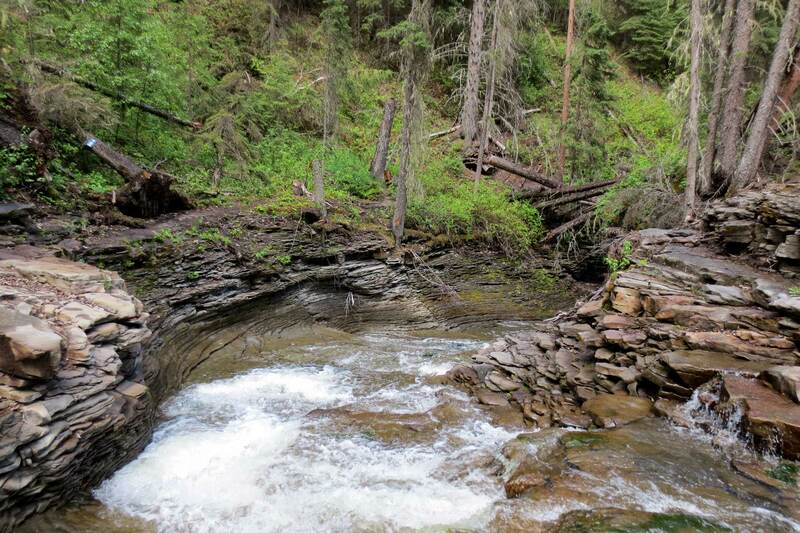 After tumbling over Bergeron Falls into a cliff-lined amphitheatre, Bergeron Creek has one final obstacle to overcome on its course to the Murray River, resistant beds of sandstone. It achieves this by cutting a narrow canyon, through which it tumbles. 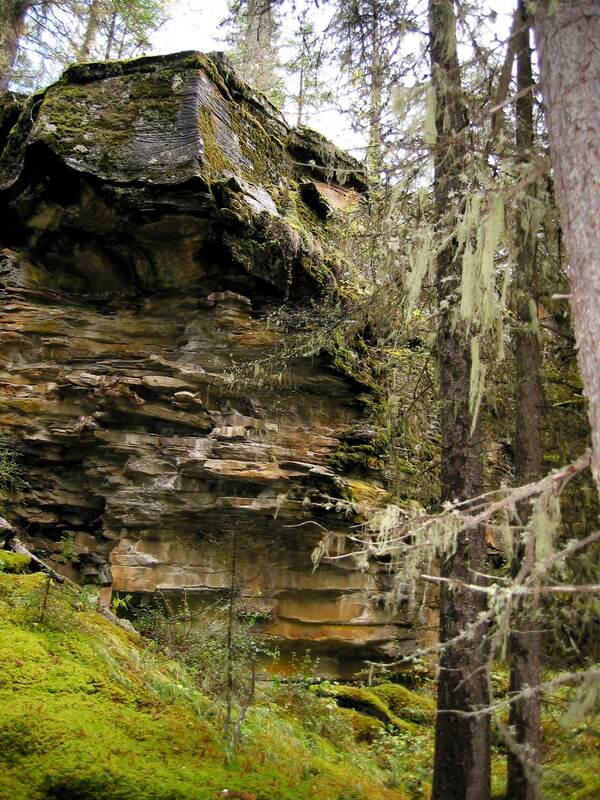 The sandstone layers are firm enough to resist further erosion, and therefore persist as vertical cliffs on each side. The moist microclimate that results promotes lush vegetation, an ideal environment for the Pacific Wren. Listen for its song, which is one of the most complex and rapid of all birds in North America. The pool at the base of the canyon is the end of the creek for fish migrating upstream — they can sometimes be seen from the viewpoint above. 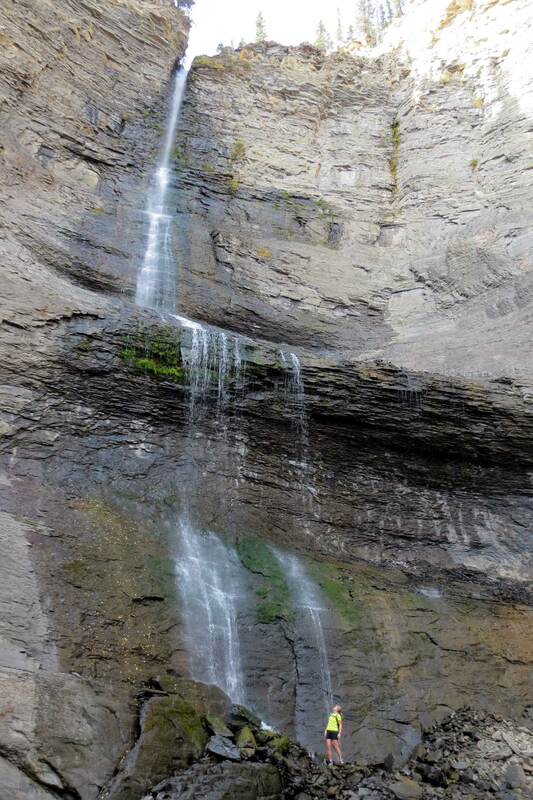 The original route to Bergeron Falls went through the bottom part of the slot canyon then led up a ladder to get up the cliffs. Concern about the long term safety of this route led to the construction of the current trail, which effectively bypasses this challenging section. When creek levels are very low in late summer, it is possible and rewarding (but very slippery) to ascend the creek via the canyon bottom. The dissolved load consists of minerals that dissolve in water, such as calcium and iron. 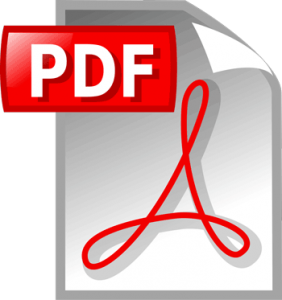 The suspended load is fine particles such as clays that are kept in suspension by the turbulence of the water or by their electrical charges repelling each other. The bed load is coarser particles such as sand, gravel, and boulders which bounce along the stream bottom. The bed load is responsible for the majority of stream erosion. This occurs mainly in flood events. So it is the rocks carried by the water which has eroded this canyon. Dinosaur tracks occur in the sandstone layers that form the canyon walls. Where flat surfaces are exposed, it is always worth looking for such tracks — a few poorly preserved tracks can be found on the bedrock slab over which the trail passes at the top end of the canyon. Flood events may wreak havoc with trail maintenance, but they are welcomed by paleontologists, because they often expose new dinosaur tracks. Natural casts of such tracks may break off and get washed down and through the canyon. There are a few such tracks close to the trail on the gravel bars downstream. First, the valley glacier moving down the Murray River drainage carved a U-shaped valley. 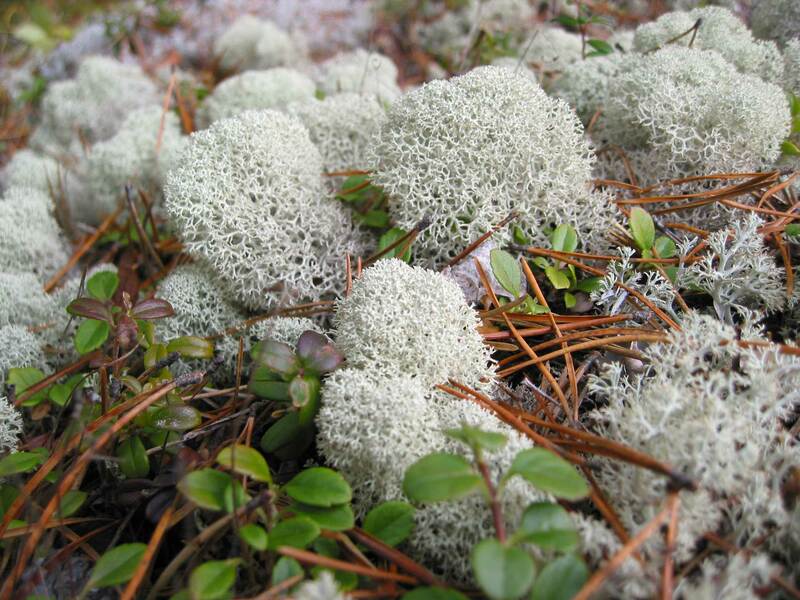 These are commonly found in glaciated areas, and have a flat valley floor and steep sides. In this case, the valley walls are composed of the flat-lying resistant sandstones and siltstones of the Kaskapau Formation. Then Bergeron Creek flowed over the steep sides cut by the valley glacier. This eroded a channel which, over time, enlarged and retreated upstream. The rock in the amphitheatre has many sets of parallel cracks called joints. Rock that is jointed like this is easier to erode. 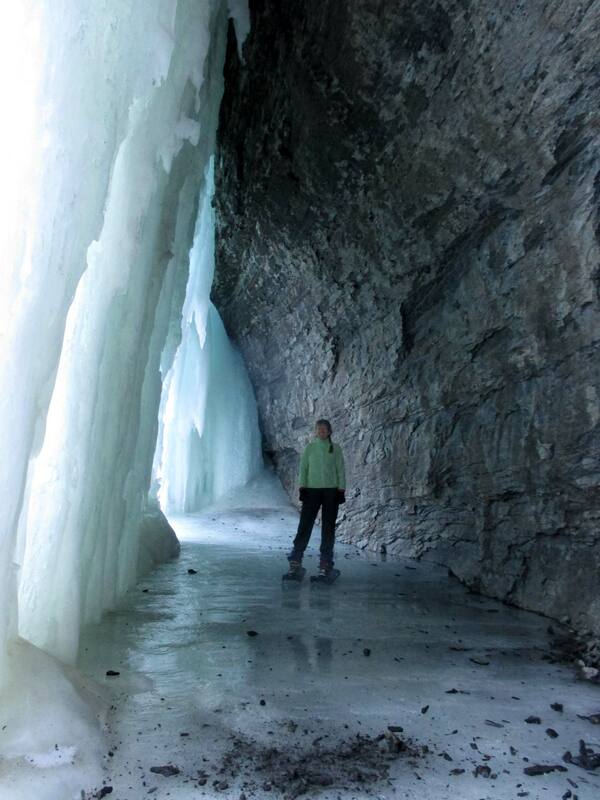 Water entering the joints expands as it freezes, enlarging the cracks. Because the joints here are vertical, the steepness of the cliff face is maintained as it erodes. 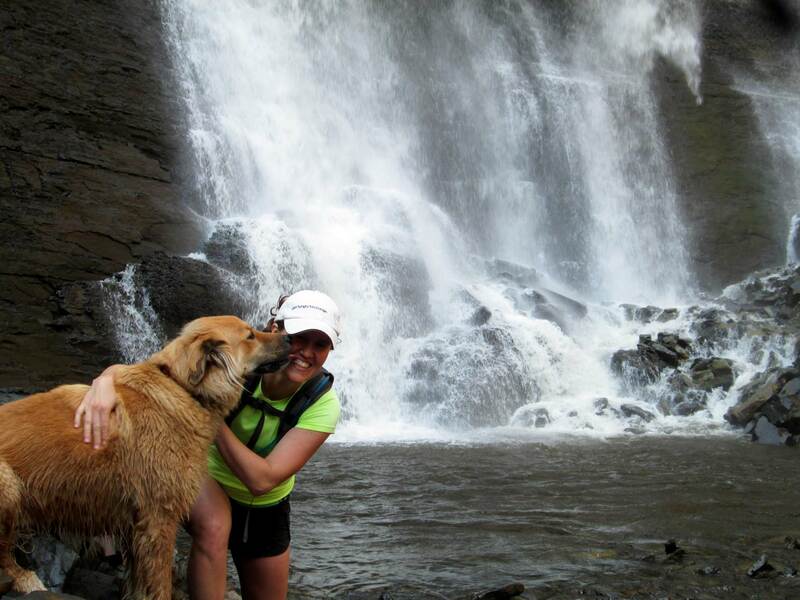 This is the reason why the falls are so high and steep. 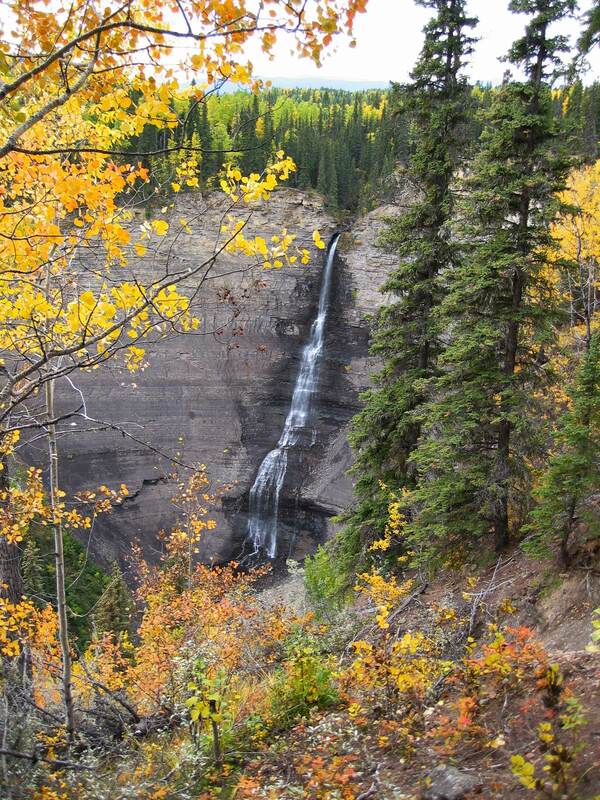 Bergeron Falls present an awe inspiring sight. 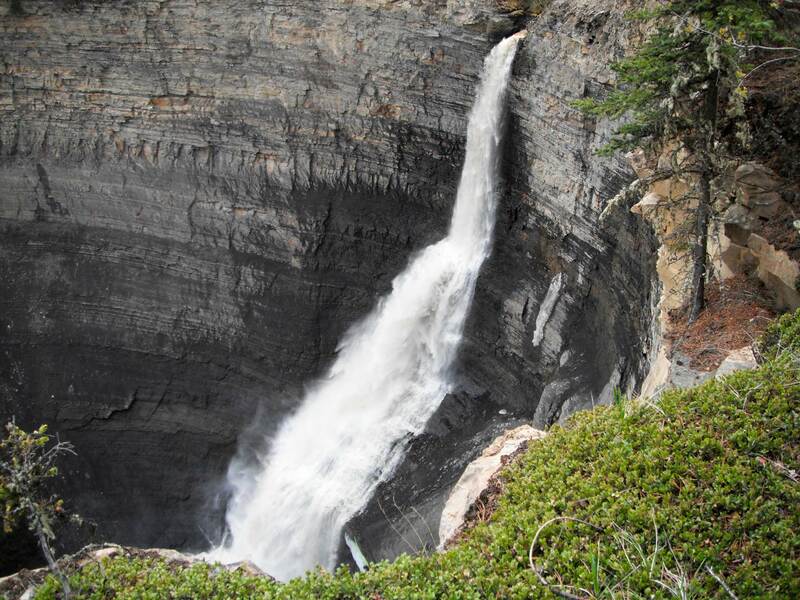 They alternately plunge and cascade down for a hundred metres into a cliff-lined amphitheatre. Taking a shower beneath the lowermost fall is always an invigorating experience. Watch out for falling rocks from above, and do not attempt to scale the cliffs — they are composed of very loose rock. 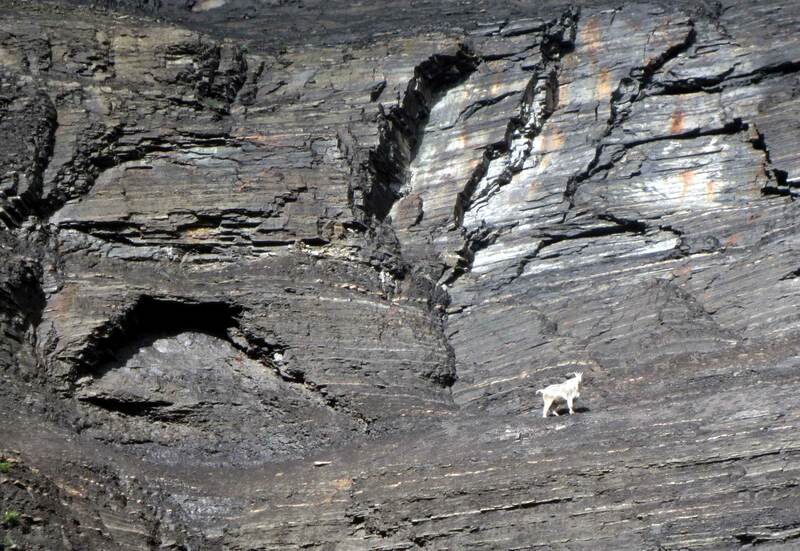 Occasionally mountain goats can be seen on the steep cliff faces. 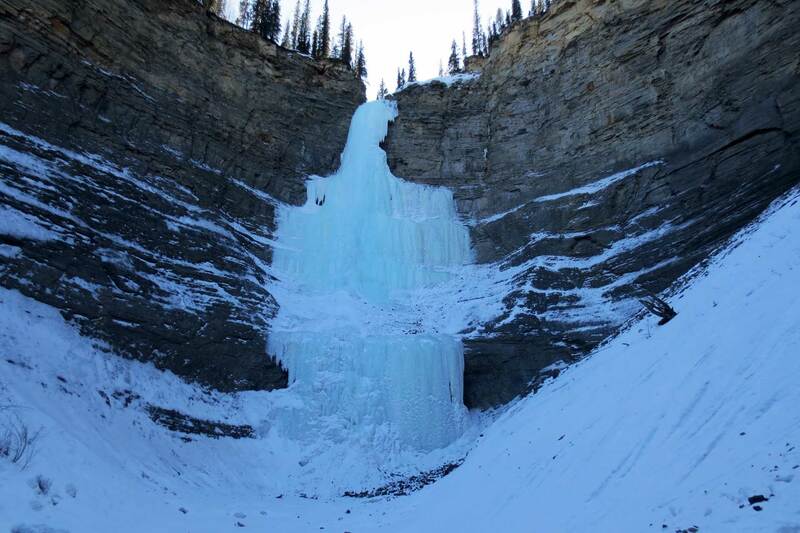 Bergeron Falls present a good challenge to ice climbers in winter because of their height, although only the vertical sections are truly technical. 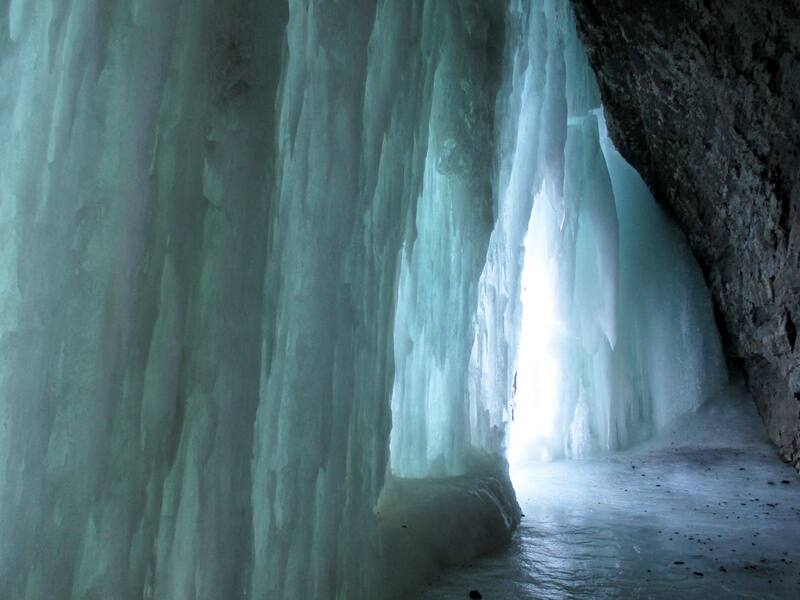 Most years an ice cave forms near the bottom of the falls, forming an attractive destination in late winter. 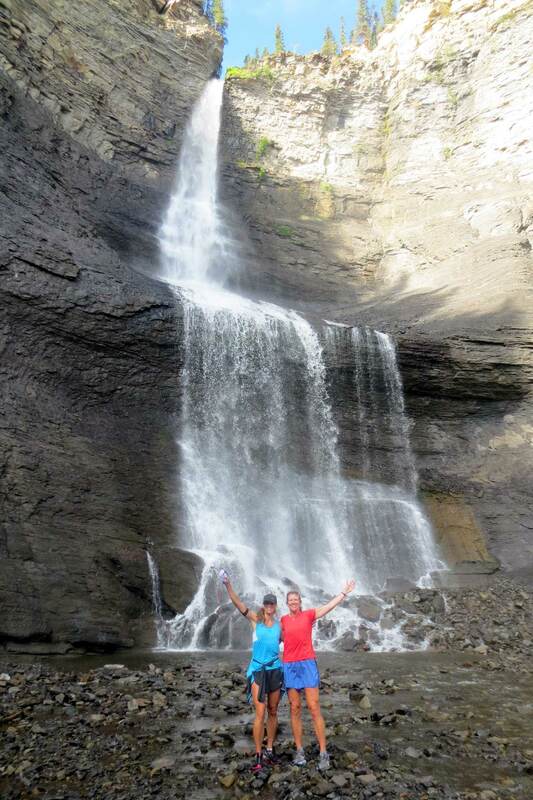 Three viewpoints showcase different aspects and features of the falls. Please do not approach the cliff edge elsewhere, as it is precipitous and unstable in places, and heed the barricades which have been installed. 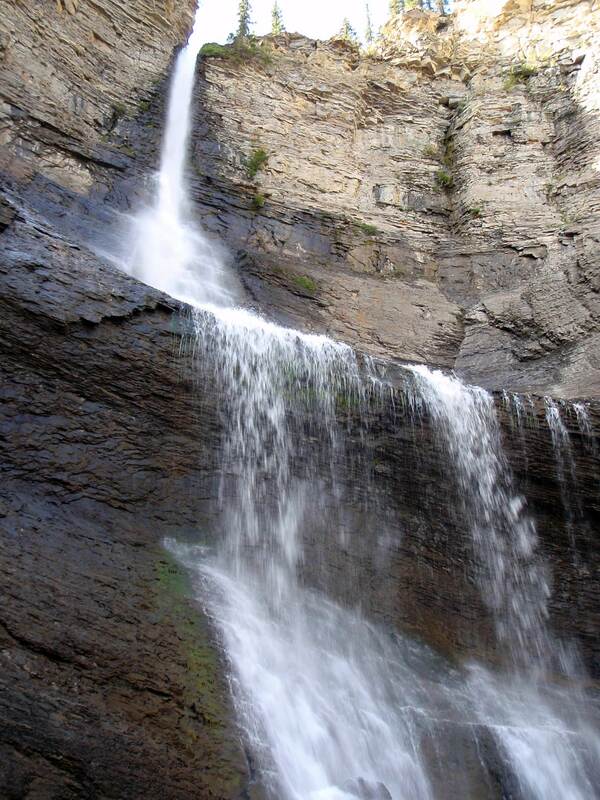 The falls are at their most impressive after heavy rains, and the sight of the highest accessible waterfall in the region in full flood is an unforgettable sight, now made much easier because of the bridge offering a safe crossing over the creek. 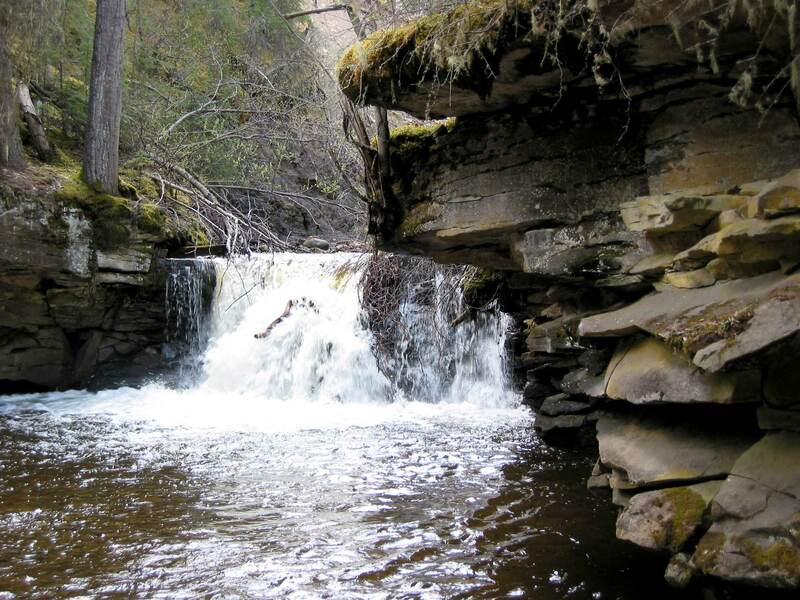 As Bergeron Creek descends towards the falls, the first obstacle it encounters is a resistant ridge of sandstone. 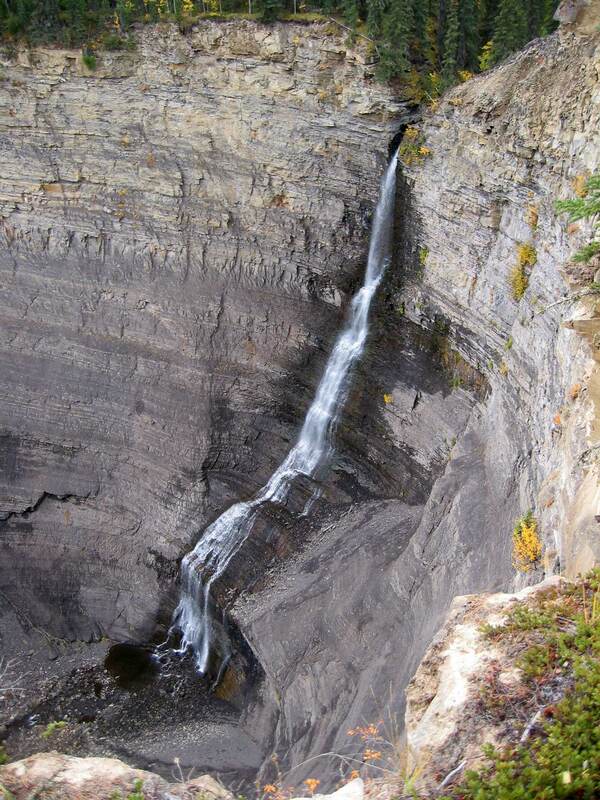 It finds a way past this ridge by swinging north, making a 180 degree hairpin bend around the rock band, and then flowing south before veering east towards the falls. These bends are known as incised meanders, formed as the creek cuts down into the bedrock as the land slowly rises. The resulting knife-edge ridge is known as Scalpel Ridge, and it makes for a pleasant side trip, ending at a bench beside the creek. Rock layers in this ridge have yielded numerous dinosaur footprints, mostly in the form of natural casts. Some of these loosen and end up in or beside the creek. 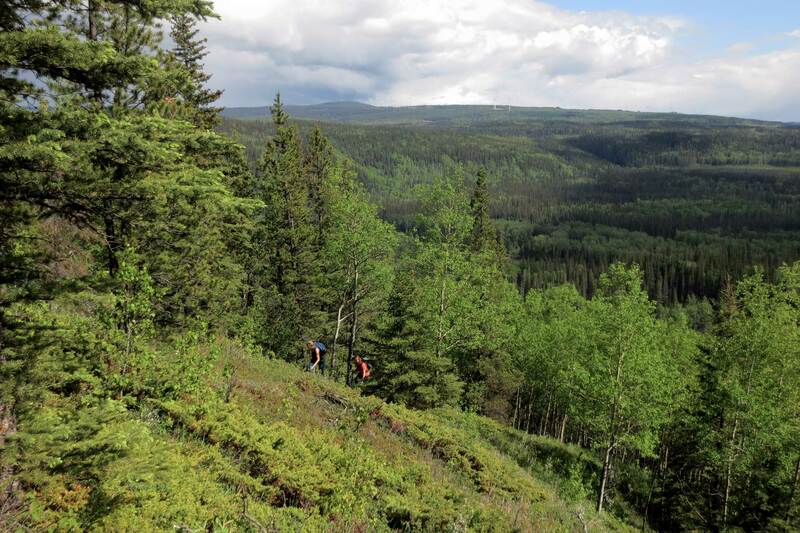 They are then salvaged by members of the Tumbler Ridge Museum Foundation, and hauled by various means up to an old helicopter landing site through which the main trail passes nearby. Some of the larger, better-preserved ornithopod footprints recovered in this manner have been weighed at just under 50 kilograms.